Sunday, and it’s a never ending thought that wakes me up from a dead sleep and the gears in my mind start spinning and I find myself in front of a computer, but it’s nothing to a point that I need to start to even talk about it really bring it up – what’s done is done and the dust has settled and I used to put on a show until I open my eyes and found myself in the life I always meant to be living, I guess, what I am trying to say is, no dream is to big to fight for and it’s never to late to change! But even nightmare needs influence and when you can correctly identify it and you don’t get rid of it, you are only letting yourself down. Artis Palm Brush, this little small wonder, could it be the one brush to actually give you a airbrushed look with any powder? 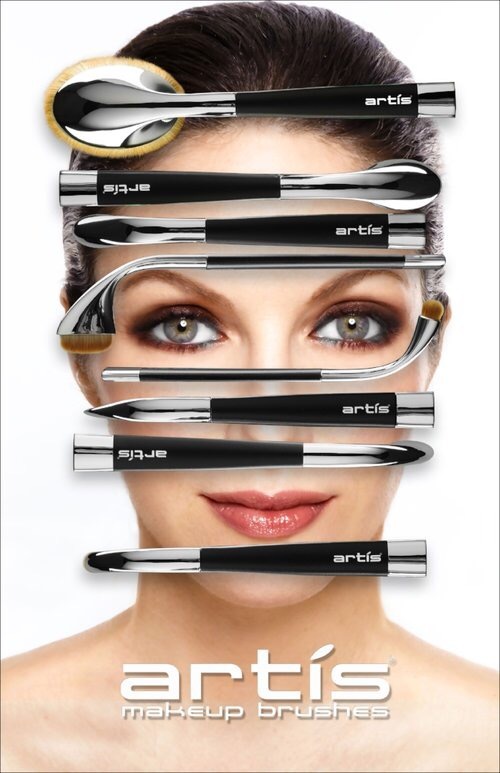 ➡️ Artis is known more for being the luxury base brush company sold within the beauty industry but there is a lot more then just the price tag, I guess what I am trying to say is you are not just paying for a name here. 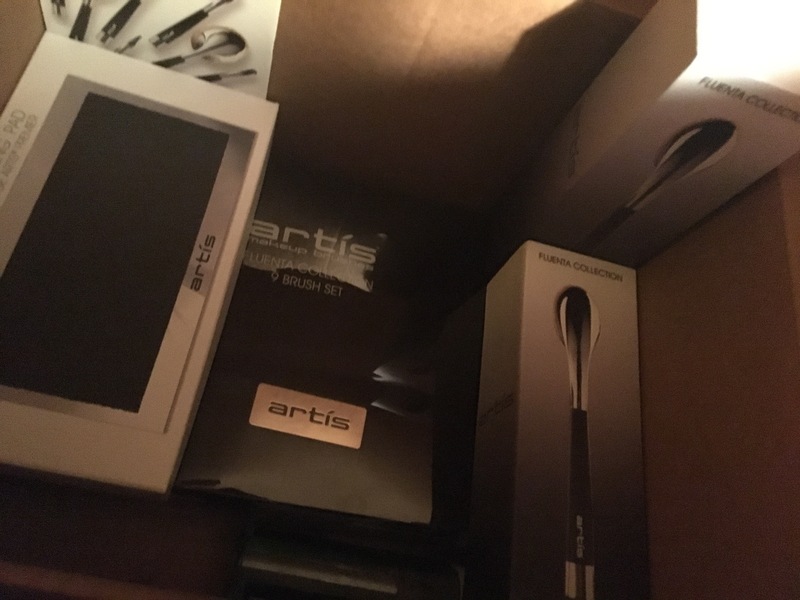 Artis does really have PR list that they send out items to on the regular, but when they do sent out items it’s, an experience to say the least. I absouloutly looove using Artis for the base and the skin care set designed to use with well…skin care! It brings a wonderful and luxury experience for clients and also for yourself. I’m not here to talk about all of the brushes per say, I’m here to talk about The Palm Brush Elite and The Palm Brush Elite Mini at that! I never really gave them a chance because and yes, Artis was the first company to create any type of brush of this design and I am talking about the full range, there are so many copies out there, well I wouldn’t say copies with this brand but I tried some of these brushes that were sent to me for consideration from Eloise Beauty and they were just very hard to use and as a man it personally reminded me of when I’ve gone for a straight razor shave how they use that dense brush to swirl and apply the cream to the face – these are the brushes here if you are interested in checking them out. The Palm Brush Elite Mini is just so amazing if you want full coverage from your compact power and also undetectable airbrush look to your skin, I really do challenge you to try this brush out because it will change your makeup game it’s even good for liquid and cream products but I only now use powder for my face and it’s effortless. In no way is it hard to hold, they have a built in finger groove for more comfort while applying makeup which is a plus. You can use a promo code at check out ➡️ BETTERBEAUTY for 10% your purchase and hey I know it’s only 10% off a $90.00 tiny little brush – but still it’s all savings at the end of the day. They even now have little draw string bags for your Artis brushes to keep them clean and they fit so perfectly inside of the second to smallest bag on the website so if you already own it, you should consider grabbing one of those bags to keep the product in good shape and keep it clean between use. Hey good lookin; yes you! 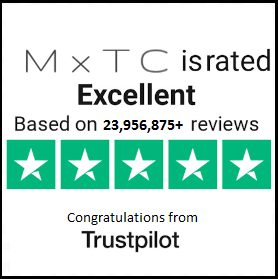 Don’t forget to check out yesterdays post ➡️ DYNAMIC DUO | M X T C and go take a look at my social and DM me if you have any questions! First off I’d like to say thank you for all the amazing PR companies that sent me gifts for my birthday! Yeah July 3rd was my birthday! Looking back I kinda can’t believe how crazy my life has been – so many ups and so many downs. This is just going to be a chit chat post and some amazing products of course. Don’t forget to smash that follow botton, for important blog updates if any post has been posted already and there is a update that is important and for you, like a give away, saving you money, news in the beauty and lifestyle world, you gotta follow for that! Accidents happen, misunderstandings happen – so why am I feelings almost betray by you. I unconditionally gave you all of me and my love and you just allowed me to go down the path I went when you could have just said at any time, I think you misunderstood me, I’m going to give you a call. I wish that’s what would have happen. So moving on to the makeup reviews I post and the brands that I work with, just like other influencers there is a lot of products that you don’t see, or companies that I won’t talk about because their products are not on brand with me and when a company reaches out to partnership with me, I honestly think to myself, oh this offer is cool, I’m sure my subscribers would want 80% off this amazing product and I make sure I look into the company, read the history of the company and more importantly, does the product work? For example SMILE SCIENCES is an amazing teeth whitening system that you can do at home, but, have the same if not better results then professional whitening – and I did just do a little introduction post for SMILE SCIENCES to my blog and you can click here to check that out – it also explains my forward thinking plan for the future and my partnership with SMILE SCIENCES. I did so much homework on four different at home whitening kits that all wanted to work with me on this idea because, well, it’s pretty darn cool if you ask me. What made me choose SMILE SCIENCES vs. the competitors, a huge thing for me was they were able to create a formula that would offer powerful prescription-grade results, with no sensitivity, all while professionally whitening teeth and removing stains from caps, crowns, and porcelain veneers. DID YOU KNOW ➡️ SMILE SCIENCES is 100% cruelty-free and vegan, not only is SMILE SCIENCES gentle on teeth, it is gentle to the environment, kosher, FDA registered and made in the USA. 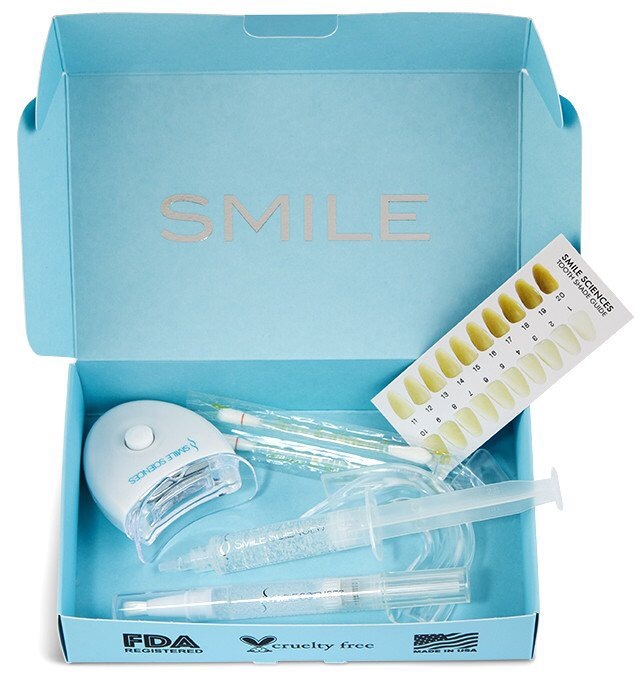 They offer worldwide shipping and superior customer service, SMILE SCIENCES is the go-to, at-home teeth whitening system to a wide array of clientele : from celebrities • top international beauty bloggers • socialites • busy parents • teachers • on-the-go business executives • anyone and everyone. This is the original mint flavour kit (also comes in bubble gum) and it costs $300.00 but at check out USE the code CAMERONMICHAEL for 90% off – that is so massive. The results after just using it one time also is so intense, every kit comes with a shade guide just so you know! This is the amazing OH HELLO kit where the LED light actually plugs into your phone to power it – it’s the most powerful light that they have. USE CODE HELLOCAMERON for 50% off this kit. ➡️ just so you know codes and coupons cannot be applied when having a sale so I would wait till after the Fourth of July sale to be over. Check out what SMILE SCIENCES has to offer right here! Don’t forget about the product of the month is the side bar or at the bottom of the page – if you’re going to buy, buy from that portal because I personally select five (5) travel size products for you guys along with some that you get to choose – plus you get a card for 20% off TOO FACED which works online and in store. I also have some other really exciting news but I legally can’t speak about it just yet but when I can it’s going to blow you guys away. Also I kinda wanna do a little Q&A – if you want to leave a comment with a question please do so or email my assistant the questions at ➡️ kevinmakeupandthecity@gmail.com and nothing is off limits! 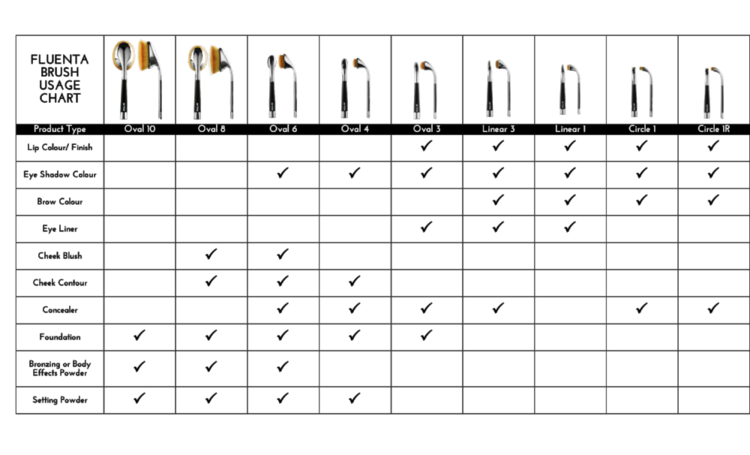 The full Artis review will be updated also from taking them on set, to self use. The unique washing pad, are there brushes worth so much money, are easy to use. You can find that post here! Thank you so much to all of you who trust in my opinion and trust that I’m not just being paid to promote products or brands that I do not like because I wouldn’t do that! Oh hey! I did get my first PR paid trip offer – details to come on that!